Spend two days exploring the very best of Cairns. Enjoy a full day in tropical Kuranda and on your second day discover why the Great Barrier Reef is one of the world's a natural wonders. Including a reef cruise and a scenic helicopter flight, this two day package is the ultimate reef and rainforest experience, leaving you with plenty of time to fully appreciate Australia's tropical north. Explore Cape Tribulation and the Daintree Rainforest on a two-day adventure from Cairns or Port Douglas!. Explore the worlds oldest rainforest in Daintree, and spot crocodiles as you cruise down the Daintree River. One night of accommodation and one lunch are included, and you can upgrade to include a Great Barrier Reef snorkeling safari and Daintree Rainforest zipline tour. Select from four-bed quad or twin-share private cabin accommodation, and enjoy personal attention from your guide on this small-group two-day tour, limited to 24 people. Discover Australia's Aboriginal culture and explore the rugged beauty of the Lower Cape on this 2-day Cooktown small-group tour from Cairns or Port Douglas. You'll drive through the World Heritage Listed Daintree National Park and the famous Bloomfield Track by 4WD, enjoy a free day to explore Cooktown and travel through the Palmer River gold mine region. The tour includes overnight accommodation in Cooktown, Australia's first non-indigenous settlement. Your 2-Day Reef and Rainforest Package Combo will take you to the two extremes of Tropical North Queensland during your stay in Cairns. Spend a day discovering the Great Barrier Reef on a cruise to Green Island. 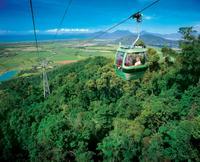 Your second day sees you exploring the rainforest with a trip on the Kuranda Scenic Rail and the Skyrail. Come and join the traditional people of Australia in a special evening of Aboriginal culture. Tjapukai means rainforest and on this engaging cultural tour you'll hear the story of the Tjapukai people, watch theatrical performances, join in interactive activities and learn the traditonal customs of the rainforest and its people. 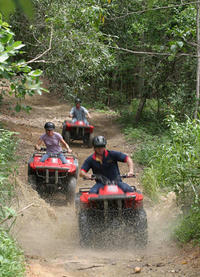 Zoom through amazing off-road and dirt trails on a guided ATV tour from Cairns, Palm Cove or the Northern Beaches. Your fantastic guide will ensure that you have as much fun as you can handle while riding through pockets of rainforest, sugarcane fields and mangroves. Perfect for beginners or experienced riders! 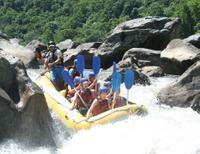 Seeking a white water rafting adventure? 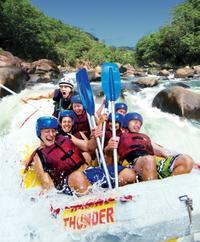 The Barron River, 20-minutes north of Cairns, offers spectacular scenery including the Barron Falls on this two-hour white water rafting tour from Cairns. This Cairns Airport transfer can be taken from both the Domestic and International terminals both to and/or from Cairns City, Palm Cove, and Port Douglas. Operating 7 days a week, 364 days a year, this one-way arrival or departure transfer offers shuttles and private options. Skip the hassle of finding a taxi when you arrive at Cairns Airport (CNS) by pre-booking a convenient shared transfer to take you to your hotel. This shared transfer service operates to hotels in the city of Cairns, the Northern Beaches, Port Douglas and Silky Oaks Lodge. Youll ride in comfort in a climate-controlled coach with ample legroom, luggage storage and a professional driver. Valid seven days per week, all year round. Leap into an adrenaline-fueled adventure with a bungy jump or Minjin Swing at the Cairns Bungy Tower, located in lush rainforest with views of the Coral Sea and the Great Barrier Reef. Whether you are a first-time jumper or an experienced thrill-seeker, you'll experience the exhilaration of soaring through the air when bungy jumping or taking the Minjin Swing, and the professional staff will make sure you have fun and stay safe. Back on the ground, enjoy relaxing around the sundeck, bar and gardens as you watch the antics of your fellow jumpers! Transfer from your Cairns, Northern Beaches, Port Douglas or Silky Oaks Lodge. For assured top quality timely service, make sure you arrive at Cairns Airport on time for your outward flight. Eliminate the end of vacation hassle of organizing your airport transfer now by pre booking this regular pre scheduled transfer service from your hotel to Cairns Airport. Explore Cairns' waterfront on a two-hour harbor cruise. You'll glide through Cairns mangroves and meandering waterways, and spot saltwater crocodiles basking in the sun. With informative commentary from the crew, it is a fun way to learn more about crocodiles and their mangrove environment. You also have the option to include lunch at one of Cairns best restaurants located right on the waterfront prior to boarding the cruise. Over three days, experience the best of tropical Far North Queensland! Go diving or snorkeling on the Great Barrier Reef, ride the Kuranda Scenic Railway and explore the Daintree Rainforest and Cape Tribulation. Combining the Cairns area's most popular attractions, this three-day super saver is perfect for first-time visitors to Queensland, plus represents a savings of 10%. From the coral beauty of the Great Barrier Reef to scenic views from the Skyrail Rainforest Cableway and encounters with Australian wildlife, this sightseeing package is crammed with fun activities you'll never forget. Special Offer - Save more than 7% on the recommended retail price by booking these three tours together. - Book Now! Explore the World Heritage-listed Daintree Rainforest, Mossman Gorge and Cape Tribulation with an expert naturalist guide. Traveling by a specially designed vehicle in small group of no more than 14 participants ensures a personalized experience. Explore the historic township of Cooktown as you drive through the magical World Heritage Listed Daintree National Park and the famous Bloomfield Track on this 4WD tour from Cairns, Northern Beaches and Port Douglas. The journey is just as spectacular as the destination. You'll venture into rainforest, the outback and cross the Daintree River before reaching Cooktown, home of Australia's first European settlement, where you'll have free time to visit the James Cook Museum (optional). Travel in air-conditioned comfort in your luxury purpose-built vehicle to Cape Tribulation; through some of the oldest rainforest in the world. Enjoy an included cruise on the Daintree River, delicious tropical lunch set amongst the rainforest, and a walk on famous Cape Tribulation Beach. 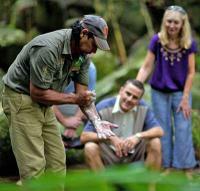 Listen to commentary by your guide on a tour of the Mossman Gorge Centre and enjoy afternoon tea before returning home. Zipline through the UNESCO World Heritage-listed Daintree Rainforest and get up close to native Australian wildlife on a fun-filled day trip from Cairns, Palm Cove or Port Douglas. After hotel pickup, visit the Port Douglas Wildlife Habitat and see Australian wildlife, such as the endangered cassowary, and enjoy a tropical picnic lunch in the Daintree National Park. Then, spend the afternoon soaring over the treetops on a zipline adventure, where youll take in views of the rainforest below and out to the Great Barrier Reef and cruise along the Daintree River. Escape to Fitzroy Island, a tropical island on the Great Barrier Reef located only 45 minutes by high-speed ferry from Cairns. Spend your day doing as much or as little as you please; relax on the beach, swim and snorkel on the Great Barrier Reef, take a glass-bottom boat tour &ndash; the choice is yours. You have the option to include only the round-trip ferry from Cairns, or to make the most of your day on Fitzroy Island, select the Activity Pass option which includes snorkeling gear, stinger suit, a glass-bottom boat tour, the use of stand-up paddle boards, paddle skis, a floating trampoline and a delicious picnic lunch. Enjoy a day of nature, horseback riding and ATV quad bike riding on this full-day tour from Cairns, Palm Cove or the Northern Beaches. Perfect if you only have one day for an adventure! Let your skilled guides lead you through pockets of rainforest, mangroves and sugarcane fields by two very different modes of transportation and experience the bush land like you never could imagine. Experience the sheer size and beauty of the Great Barrier Reef and gain a true appreciation of one of the seven natural wonders of the world. This flight includes views of beautiful Green Island and Fitzroy Island and on low tide, Vlasoff Sand Cay and Upolu Sand Cay. Sightings of manta rays, turtles and other marine life are not uncommon. If you're flying with us in the winter months, there is even a chance of spotting whales! Make the most of your visit to the Great Barrier Reef on a full-day tour by fast boat, with five hours to enjoy two premium spots on the reef with snorkeling included. Have the option to scuba dive and take a helicopter flight in order to experience the reef from all angles. A delicious barbecue lunch keeps you energized for your adventure. Expert guides welcome both newcomers and experienced marine enthusiasts to enjoy a day on one of the most famous reefs in the world. Explore the Great Barrier Reef aboard a sleek, luxury catamaran on this snorkel and dive cruise from Cairns! Spend six hours on the Great Barrier Reef at two different snorkel and dive sites. Cruise in style on the comfortable catamaran before taking a glass- bottom boat tour to Upolu Cay with your onboard marine naturalist, where you can either snorkel or scuba dive (see options below). Enjoy a delicious buffet lunch on board the catamaran before heading to Upolu Reef to continue snorkeling or diving, and take a guided snorkeling tour! This cruise is limited to 75 guests, ensuring quality customer service and passenger comfort. Explore the Great Barrier Reef on a half-day or full-day excursion that travels by helicopter and boat so that you can make the most of your time. Choose from three options for your tour of one of the world's best coral reefs and enjoy snorkeling and scuba diving. Admire views of the Great Barrier Reef from your helicopter as you get a multi-angled perspective on one of the world's top natural wonders. Travel by scenic helicopter to Green Island on the Great Barrier Reef. As you fly from Cairns, take in the views of the rainforest and the magnificent colors of the Great Barrier Reef below. Spend four hours on Green Island where you can enjoy swimming, snorkeling, walking through the rainforest or exploring the reef by glass-bottom boat. Return to Cairns by high-speed catamaran. Explore the tropical paradise of Green Island on a half day trip from Cairns. 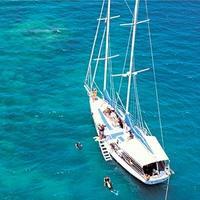 Enjoy around two hours exploring the Great Barrier Reef island with time to snorkel and take a glass-bottom boat. You can even take an optional semi-submersible submarine tour to get close to the reef without getting wet. Swim, snorkel or dive in the pristine waters off Green Island on the Great Barrier Reef. 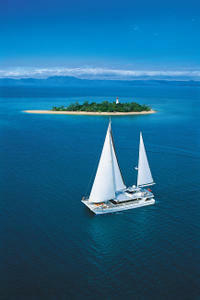 From Cairns, sail to the island in style on a two-mast schooner and enjoy a delicious buffet lunch on board. Explore the beauty of Green Island, see the rainforest or laze on the white sandy beaches and swim amongst the magnificent coral reefs. Explore Hartley's Crocodile Adventures, an award-winning eco-tourism attraction located between Cairns and Port Douglas. Cruise the wetlands to see crocodiles lazing on the riverbanks and witness the stealth and power of these prehistoric animals at the Crocodile Attack show. This innovative wildlife park has five distinct zones, showcasing Australian wildlife in their natural environment. Enjoy guided walks, keeper-talks, animal shows and a behind-the-scenes look at crocodile farming. Explore sugarcane fields, rainforest and mangroves on a horse-riding tour from Cairns, Palm Cove or the Northern Beaches. Perfect for beginners or experienced riders, your horseback ride will take you through beautiful countryside with a stop for a 'billy' tea over a camp fire. Hit the rails, the rainforest, the sky and the reef in an action-packed day trip from Cairns! You'll take the Kuranda Scenic Railway and Skyrail Rainforest Cableway between Carins and Kuranda, soar over the Great Barrier Reef on a helicopter tour, take a lunchtime cruise on the reef, then spend the afternoon swimming or snorkeling before cruising back to Cairns. What a rewarding day out! Spend the day on Michaelmas Cay, a small sand island on the outer Great Barrier Reef. You'll cruise from Cairns aboard a luxury sailing catamaran, see the reef's brilliant coral and marine life from a semi-submersible submarine, try scuba diving or go on a snorkeling tour. Lunch on board is a delicious hot and cold buffet including prawns. Take a scenic helicopter tour from Cairns and spend the morning relaxing on far-flung Vlasoff Cay, surrounded by the beauty of the Great Barrier Reef (or Turtle Beach if Vlasoff Cay is occupied). You will land on this remote coral sand island with all the supplies you'll need for your two-hour island retreat: a gourmet picnic hamper including champagne and nibbles, picnic blanket, beach umbrella, deck chairs and snorkeling equipment. What more could you wish for! Looking for some adventure in paradise? 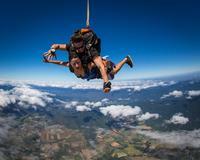 Get high in the sky on a tandem sky dive over Cairns with spectacular bird's-eye views of the Great Barrier Reef and World Heritage-listed Rainforest. No experience necessary! Enjoy the tranquility of the rainforest as you soar above the canopy aboard the Skyrail on a day trip to Kuranda from Cairns. Choose from a variety of options including Kuranda Scenic Railway, Tjupakai Aboriginal Cultural Park or the popular Rainforestation Nature Park. See the sights of Cairns city, port and beaches on a small-group afternoon tour! You also have the option to combine the tour with a morning cruise to Green Island, where you can spend a few hours snorkeling or cruising in a glass-bottom boat. Whether exploring Cairns or relaxing on Green Island, enjoy a personalized experience on this small-group tour, limited to 20 passengers. Discover the living history of Australia's indigenous Tjapukai people -- the people of the rainforest -- at Tjapukai Aboriginal Cultural Park in Cairns. Immerse yourself in traditional Tjapukai culture and learn to play a didgeridoo, throw a spear and catch a boomerang. One of the world's oldest living cultures is brought to life by Aboriginal dance performances, storytelling and various interactive crafts and activities. Tjapukai Aboriginal Cultural Park will provide a unique insight into the traditional way of life as told by the Aboriginal people. Fly high over the Barron Gorge and stunning rainforest canopies before heading over magnificent sights such as the Great Barrier Reef, it's spectacular islands and sand cays. This 45-minute helicopter flight allows one to see the 'best of both worlds', as it showcases the highlights of heritage rainforest and the Great Barrier Reef.